Glen Edwin Wesley (born October 2, 1968) is a retired Canadian ice hockey defenceman of the National Hockey League. Wesley played in four Stanley Cup Finals, winning it once in 2006. 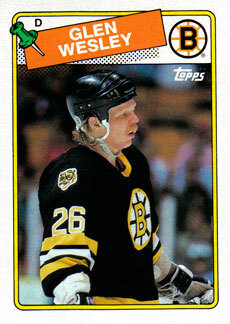 Wesley was drafted 3rd overall by the Boston Bruins in the 1987 NHL Entry Draft. He earned a berth on the 1988 All-Rookie team. On June 5, 2008 Wesley announced his retirement after his 20th NHL season, and his 10th with the Carolina Hurricanes. He remains in the Hurricanes organization as Director of Defensemen Development. The Hurricanes retired Wesley's No. 2 jersey February 17, 2009, while hosting the Boston Bruins at the RBC Center in Raleigh, NC.